Accurate navigation is a fundamental requirement for robotic systems—marine and terrestrial. For an intelligent autonomous system to interact effectively and safely with its environment, it needs to accurately perceive its surroundings. While traditional dead-reckoning filtering can achieve extremely low drift rates, the localization accuracy decays monotonically with distance traveled. Other approaches (such as external beacons) can help; nonetheless, the typical prerogative is to remain at a safe distance and to avoid engaging with the environment. In this chapter we discuss alternative approaches which utilize onboard sensors so that the robot can estimate the location of sensed objects and use these observations to improve its own navigation as well as its perception of the environment. This approach allows for meaningful interaction and autonomy. Three motivating autonomous underwater vehicle (AUV) applications are outlined herein. The first fuses external range sensing with relative sonar measurements. The second application localizes relative to a prior map so as to revisit a specific feature, while the third builds an accurate model of an underwater structure which is consistent and complete. In particular we demonstrate that each approach can be abstracted to a core problem of incremental estimation within a sparse graph of the AUV’s trajectory and the locations of features of interest which can be updated and optimized in real time on board the AUV. 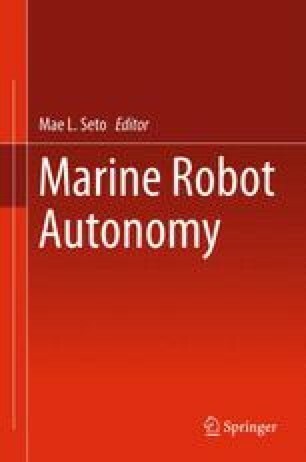 The work described in this chapter was partially supported by the Office of Naval Research under grants N00014-05-10244, N00014-11-10119, N00014-07-11102, N00014-06-10043, N00014-10-10936, and N00014-12-10020, and by the MIT Sea Grant College Program under research grant 2007-R/RCM-20. We wish to acknowledge the contributions of Michael Benjamin, Joseph Curcio, Georgios Papadopoulos, and Andrew Patrikalakis at MIT. Each project had a number of commercial and academic partners which we also wish to acknowledge including Ryan Eustice and Ayoung Kim (University of Michigan); Doug Horner and Tad Mazek (Naval Postgraduate School); Ed Matson and Bryan Schulz (iRobot); Jerome Vaganay, Kim Shurn, and Mike Elkins (Bluefin Robotics); Scott Reed, Alastair Cormack, and Jose Vasquez (SeeByte); and Dan Kucik and Paul Carroll (Naval Surface Warfare Center-Panama City).